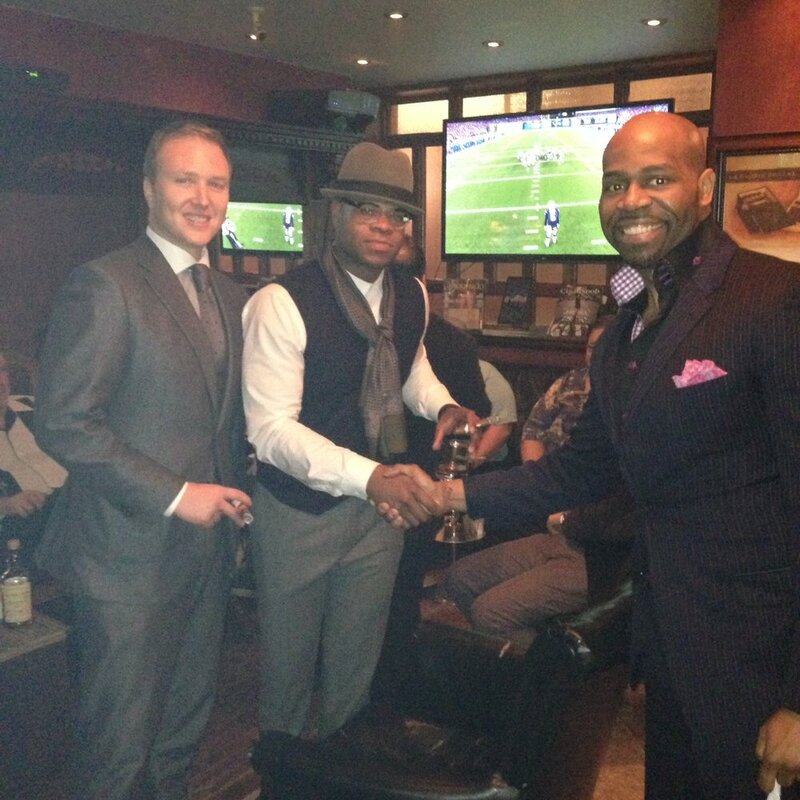 When the editors at Cigar Advisor magazine proposed for me to write an article about suggestions in upgrading the wardrobe of its readers, I knew just who to call: my friends Jamian Polk, a young, athletic, IT consultant who shows no fear when it comes to pushing the boundaries of men’s fashion, and Gabriel Schulman, an up-and-coming financial adviser and art collector who was recently named one of the top “30 under 30” in the art collecting and selling world. Growing up in Durham, N.C., Jamian learned from his father the way of the Southern Gentleman, while Gabriel pays homage to his NYC upbringing by keeping more of a European business profile. Now don’t get me wrong – I’m not about to suggest that dressing the cigar smoker means wearing a smoking jacket á la Hugh Hefner in order to enjoy a good cigar. In fact, one of my most enjoyable experiences with a stogie was while watching the NY Giants win Super Bowl XLVI, when they beat the New England Patriots. I remember I was wearing sneakers, sweatpants and a sweater! However, there’s something to be said about entering a cigar room and dressing the part. It’s paying respect to the times of yore, when men wouldn’t step out of the house without a suit and a hat; when gentlemen got together after a long day at the office to have a glass of scotch and enjoy a good cigar to unwind, before heading home. I don’t know, it reminds me of my grandfather; of the time of invention and business dealings; of social gatherings, not social media and smartphones – all camaraderie and conversation. Where business deals got done, and even wars got resolved (see the iconic Sir Winston Churchill). What I’m trying to say is that I like my cigars the way I like my women; dark, bold, and from the Caribbean. As such, I like to dress the part when I take them out, and so should you. The food tastes better, the drinks feel stronger, and the cigar gives you notes you never knew it had before. Why, you ask? Because when you dress the part you feel better about yourself, and everything you do will be enhanced by it. This is why when smoking in the backyard I prefer shorts, but when in Rome…well, you catch my drift. My fellow brothers and sisters of the leaf, I’m not a fashion expert, and this is not a fashion magazine. But dressing the cigar smoker to look the part for a steak dinner, drinks, cigars and a good time, I must tell you, gains you the respect of your peers. This means a properly-fitted pair of trousers, shirt, and suit jacket, and clean, polished shoes. If you want to be daring and decide to be playful, add a pocket square and/or a colorful pair of socks. A close fit is a must. For the past four decades, American men have been sold on wearing suits and sport jackets that are one and two sizes larger than what they should be. You shouldn’t feel like you can’t move your arms in it, but you shouldn’t be swimming in it either. You should feel good in your clothes. Remember, you’re dressing for yourself first, and any compliments you get will be a reflection of the way you project yourself. Being attractive is not about looks, it’s about attitude towards life and towards those around us. We don’t strive to be attractive to pick up a mate, we do it because we want to treat others the way we’d like to be treated. We dress nicely to show respect for the rooms we enter, as we’d like to receive the same in return. Be nice, dress the part, cash in your chips. To drive my point, after dinner, I took the fellas to the Papa Juan Cigar Room, in Harlem, NYC. Five minutes after shaking hands with the gentlemen there, my friends were complimented on their style as introductions were made. Drinks were offered, conversations ensued, friendships were born, and doors were opened for business opportunities – old school, just as I remember my grandfather doing it. It was almost poetic. Make an investment in quality, timeless clothing. Stay away from fashion trends. Create your own style, which you develop little by little, with patience. eBay has been great for accessories, too. Most importantly, find a good tailor who understands what you really want. This will save you a lot of money, time and even frustration. I have been lucky to find one in Mr. Pablo Vargas, from the Stanton Tailor Shop in The Lower East Side, NYC. In fact, this is where I met Jamian and Gabriel. He has taken-in suits, pants and shirts for me as many as two sizes, and gives me the benefit of taking off-the-rack clothes and making them my own, almost bespoke. Many years ago, a good friend of mine gave me a book, “Dressing the Man,” by Alan Flusser. To this day, I’ve treasured it and still open its pages for inspiration. I would recommend it as a starting point, and for constant reference. Knowledge is power, and so is learning how to dress like a gentleman should.